Hi Beth! Another great giveaway! I'm glad you continue to do these, and I am VERY glad that you are posting all your PowerPoints to SlideShare. I'm presenting on social media next week to a group in Prince Georges County in Maryland, and some of your slides (SQUIRREL!) are very useful. Of course, I will credit you and all other slides I borrow. Brian Solis's book looks like a winner, particularly with those way cool graphics. That Jess is very talented. Putting complex and detailed ideas into graphics is an art form in itself. I hope that I win the book but if I don't I will track it down at my local bookstore. Beth, The book looks really interesting and the visuals make it more so! While organizations are looking to incorporate more social media in their plans, it surprises me how few of my colleagues, that is communications professionals working in global health and international development sectors, are actively engaged in social media. If they aren't using it, can they effectively design and implement plans that use it? Would love to win a copy, especially as my org is in the middle of creating a social media plan at the moment! Beth, thanks for reviewing this book. It is exactly what I am looking for to help introduce utilization of social media into my agency. I work for an organization that provides substance abuse treatment which include a methadone program. Such programs are not popular when they are located in communities, as residents feel they are bringing the problems of addiction into their environment. But of course we know that the problems are there already and we are a positive resource in helping to alleviate the effects of substance abuse for the individual and communities. Garnering support, both personal and financial, is very difficult when your program deals with a problem as misunderstood as addiction. I am working to integrate the use of social media throughout our program. This book will be a great resource and help me to convince our board and director that we don't have to lay low in the community, and that the use of social media will provide positive support for the work we are accomplishing. Your blog has provided me with excellent information for helping me to do this. Thanks so much for your help. Beth, thanks for the chance to win the book! I heard him speak at the Ragan conference in Atlanta. I'm looking forward to your book w/Allison Fine, too! As a marketing director for a non-profit that is entering the social media world, sounds like this book would be a perfect learning tool. I enjoy your daily blogs. Hope to win. Perfect timing...I'm in the process of creating a social media plan for the nonprofit I work for, http://www.judsoncenter.org. This book looks like a "must read"! As a digital marketing and media student, I would love to get a copy of this! Hi Beth - thank you for sharing your thoughts on Engage! I'm definitely putting it on my reading list. I listened to a webinar with Brian Solis yesterday. He showed this graphic along with others. One of my tweets before I'd even seen this post was along the lines of "have to read Engage!". And like everyone else here, I love free stuff. I've only met Brian once, sharing quips and super-necessary burgers after a long day of Office 2.0 a few years back... Great guy, and the book looks great... Secretly, I've been trying to figure out how to get a free copy for a while now, to no avail. Would be cool if I'm the lucky winner! Thank you for this and all your blogs. When I hear or read Brian Solis there's always much to Engage. Indeed, I wonder about something in the graphic shown in this post and in the famous Conversation Prism, as useful as they are. The brand is shown at the center. I'm a marketer. I love branding. Yet I believe the social space revolves instead about consumers--no, people--and their communal behavior. Our brand prospers when it's relevant to their behavior and feelings and we position it to serve them. I'm halfway through Trust Agents and would love some more literature on these subjects! Thanks for the giveaway. I'm working with a non-profit that is just starting to use social media channels.Sometimes it can be hard for me to get them to understand what I'm trying to do on these platforms. A copy of this book would help me explain to them how web 2.0 works. As well as helping us develop more effective strategies to reach out to our followers. We don't have a lot of resources so winning a copy would mean a great deal. Don't know if you've given this away, but I'd love to win it for my NPO! This sounds like quite an interesting book Brian has written. 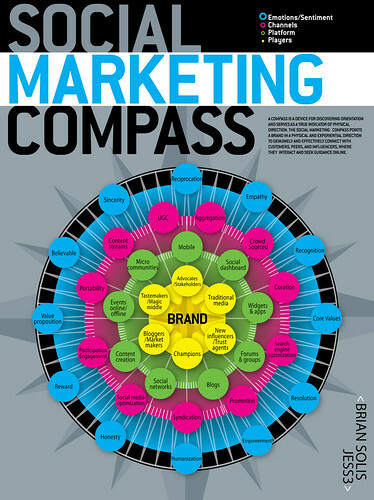 I really like the idea of the "Social Marketing Compass" and look forward to reading his book. Thanks for sponsoring the giveaway. Hi Beth! Would love to have a look at the book--it sounds terrific!